Nonfinancial corporations grew holdings of liquid assets 25 percent over the past two years to $1.84 trillion, the highest level on record. This trend reflects efforts by companies to protect balance sheets and reduce their reliance on credit markets for future growth. Some corporations have begun to use built-up cash for stock buybacks, but until more sidelined capital is invested in the broader economy, the recovery will remain choppy, and risks of a double dip will persist. The consumer sector, which accounts for 70 percent of GDP and typically drives expansion during the early stages of recovery cycles, will remain strapped by high unemployment, minimal income growth and tight credit markets for several quarters to come. Productivity soared in recent quarters, but businesses have stretched existing resources to their limit and will soon need to hire. During the year ending in the first quarter of 2010, output per hour climbed 6 percent, the most significant increase in eight years. Compensation declined modestly during the same 12-month period, contributing to stronger corporate profit margins. Pre-tax corporate profits in the first quarter climbed to 13.7 percent of gross domestic product (GDP), up from 9.6 percent of GDP one year earlier. While several indicators point toward the resumption of moderate employment growth this year, lingering corporate caution poses a significant risk to the onset of a sustainable recovery. After cutting costs and slashing payrolls to survive the recession, many companies remain hesitant to shift out of conservation mode. Based on the results of a recent survey, most corporate finance executives plan to maintain or increase cash holdings over the next six months. If this occurs, the business sector could inadvertently set into motion another self-perpetuating downturn. With the recovery expected to progress at a moderate pace through the second half of 2010, office vacancy should begin to stabilize by year end at approximately 18 percent. Even if companies ramp up hiring in the near term, however, it may be several quarters before vacancy rates recede. Many markets amassed significant amounts of shadow vacancy through the recession that will need to be filled before companies increase space needs. The industrial property sector stands to benefit from strengthening international trade and modestly higher retail sales. Following the drastic correction cycle of 2008 to 2009, companies need to increase inventories to meet even modest demand levels, a trend that began to unfold in the first quarter. Furthermore, the corporate sector faces significant pent-up demand for equipment after several years of conservation. As capital spending gains traction this year and commercial development remains minimal, industrial vacancy will level off. During 2010, vacancy is forecast to rise just 40 basis points to 13 percent, following a 200 basis point increase last year. This entry was written by marcusmillichap, posted on July 16, 2010 at 11:13 pm, filed under Research and tagged Corporate Cash. Bookmark the permalink. Follow any comments here with the RSS feed for this post. Trackbacks are closed, but you can post a comment. I agree that there is a certain degree of “intractability” with regard to business spending and investment; however, too often there seems to be an anti-business sentiment to all of this, especially in the popular press (Krugman in the NY Times). Obviously, the business “sector” is not an entity that makes decisions together to withhold investment, but rather all of these players see too much risk and uncertainty to commit. There should be more attention focused on the government’s role in creating conditions of uncertainty, particularly with regard to taxes, interest rates and regulation. BP proves the need for regulation. Taxes were moved way too low under W, especially on households with more income than all of Morocco. And interest rates are meaningless if almost no one is borrowing. Japan in 1990-91 scratched its head at ultralow loan demand. We now know what was coming. If I were Ben Bernanke I’d announce a date about nine months hence, saying “rates go up THEN.” Can you imagine there might be a rush to borrow while money is still cheap? An interesting possibility. Hey; it works for other things. 1.) rates: they can’t go lower, and the government has done nothing but accomadate ANY economic weakness with lower rates for decades and has continued to make money as easy as possible…this “condition” couldn’t get any more “certain” as far as government action goes. 2.) Taxes: I agree… lot’s of uncertainty here and likely to continue as many states refuse to run deficites and didn’t run surplus during the good times. Further, movement in Government to cut deficites. 3.) Regulation: IMHO the economy over the past 20 years has outsourced about as much of the “pollutive” industries as is likely… other countries are starting to realize it’s not good to grab market share at the expense of the population (see China)… this may be a net positive over the next 20 yeasr as other countries “catch up” on pollution laws. Any takers on this bet? hiring will “miraculously” pick up the day after this fall’s votes are all counted. Not rocket science at all. IMHO we are in a whole new paradigm and I would “watch out” in certain sectors, even given what we’ve seen the past few years. Essentially the entire US economy has been slowly transformed to “service” (see value of S&P for various sectors) as it fits into the “new world situation” where most basic materials and manufacturing is done with cheap labour (obvious countries). This has been facilitated, and indeed put into hyperdrive by 1.) the riduculously low level of rates the Fed as continued to fuel the process with. 2.) The willingness of the rest of the world to hold U.S. denominated debt, which amounts to a massive IOU. 3.) The facilitation of the above AND further “IOU extension” via the Fed’s enviable position in the world as printer of systemic IOU’s… ie. the $ U.S. position as “world reserve currency”. Result: The U.S. has essentially had the preverbial “free lunch” for at least 2 decades, probably more. Financing every mistake with lower rates and printing money. See a graph of total debt by U.S. contituents, total money supply, and total reserves of $ U.S. around the globe. The game is over… why? Rates are zero. In the past, every “dip” was met with lower rates and free money for the banks. This was known for years as “The Greenspan put option”. Speculation would always be bailed out by lower rates. Well, as we can see, rates aren’t going any lower. Further, media reports pretty much show all the big “counterparties” to the game have caught on, AND the U.S. authorities are also realizing what happened. The U.S. will be VERY LUCKY if foreign lending doesn’t dry up completely. China alone has to lend billions weekly just to sop up fed borrowings on the current debt. DK: What else could Helicopter Ben & Co. have done? Pull a Hoover and let the ship go down? It would have, after Lehman. 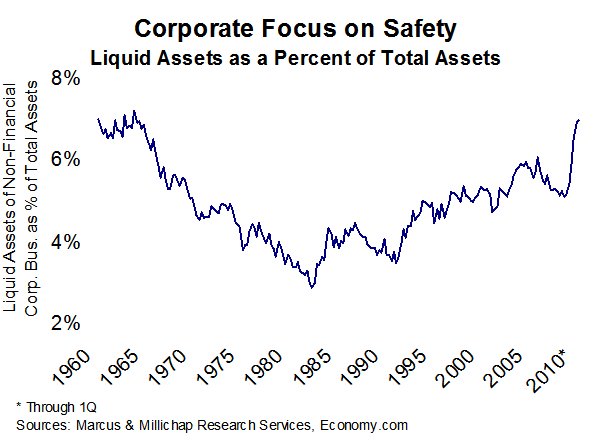 I think companies are going to want to be increasingly asset poor, after labor “under”utilized. The Cash Flow statement has been king over the last year or so, and will probably continue to be that. I look for more bartering, too, even among businesses. Anyone want to go in on ten hectares of good ag dirt in southern Alberta? Agreed in this latest round, but the Fed should have let the economy go into recession several times over the past 20 years rather than progressibely lowering rates to where they are now (zero). FURTHER, IMHO this business that politics (presumably return to Republican control) will fix anything is misguided. The current bust is a result of the past boom, period. Simple physics. All you can do now is wait. I completely agree with Greg. Intrade betting puts a Dem loss in the house at 50%. The resulting gridlock is just what we need to bring some clarity to the situation. It isn’t much, but the fact that nothing will get legislated 2011-12 is far better than the unknown – at least in the short term. Merry Christmas, but not much after that. Any bets on a “Lost Decade” ala Japan in the 1990’s ?? Since we are on the pace of economic recovery, our real estate world be in a good side now.And it will really stabilize the office vacancy for sure.Then a lot of job opportunity to come. 1.) It IS different this time, massive boom –> bust. Rates zero, no help there. 2.) Jobs?? Look at the number of jobs in the past 30 years in “service”, etc. Look at your local strip mall and tell me what in there is “essential”? Answer: maybe the grocer, and that’s pretty much it. The entire economoy has been running on the premise that we can go further in debt and buy stuff from China. Game over. 3.) Phoenix/Scottsdale? Gimme a break. The most over-retailed place in the most over retailed country on the planet… all fueled by debt. 4.) Dirt? Common, anyone REALLY think with the demographics in the US that second homebuyer market is coming back? NOT! Babyboomers are net SELLERS of this stuff as they age. 5.) Office? Well, office was great when the whole economy revolved around importing dirt cheap goods for consumer products and “financial services industry” which went from like 7% of the economy to 35% in 30 years. If you believe Obama is right and there are actually good loans to make out there… jump on board! Be interesting to see just WHO the big office space users ARE in the valley?? Anyone? When the government starts limiting imports from polluters & slave wage countries to help level the playing field I’ll be investing, till then, forget it. Actually, I mispoke above… if the FEd starts buying buying everything in sight including stocks, bonds and RE, OR there is some SMOKING DEAL of course I’d buy… Fed will destroy the currency eventually, even the Republicans will urge the printing of money in order to try and stave off deflation… they won’t risk being labeled “Hooveresque” again. :)) Note Bush’s moves. Republicans talk tough, but in a couple years with unemployment in the high teens they’ll be knucking under just like anyone else.